The Asia Fungal Working Group (AFWG) of the International Society for Human and Animal Mycology (ISHAM) is a group of mycologists and infectious disease specialists based in Asia who are committed to facilitating the improvement of the diagnosis and management of invasive fungal diseases and supporting best practice in the region through educational programs and surveillance studies. As part of its educational programs, the AFWG intends to feature brief CME activities on its website, covering topics relevant to colleagues throughout the Asian region. For the purposes of this educational activity, a summary of some of the key findings from the paper by Tan and associates – “Incidence and species distribution of candidaemia in Asia: a laboratory-based surveillance study” (Clin Microbiol Infect 2015;21:946-953) – has been prepared. Readers can test their knowledge of the presented material by completing the multi-choice questions that appear after the summary. Over the last few decades, the number of immunocompromised inpatients and outpatients in the community has grown, largely because of advances in medical care such as intensive care interventions, cancer therapies and organ transplantation. This vulnerable population is at risk for opportunistic infections, particularly fungal infections, with the incidence of such infections also rising over this period. Candida species represent one of the leading causes of healthcare-associated bloodstream infections, and a steadily rising incidence of candidemia has been identified in many areas. Invasive candidiasis continues to carry a high attributable mortality, and efforts to improve outcomes of Candida infections must be supported by adequate epidemiologic data describing infection frequency and species distribution. As no large-scale cross-sectional study of candidiasis across Asia had been performed, members of the AFWG collaborated to conduct a 12-month, laboratory-based surveillance of candidemia at 25 hospitals from 6 countries/regions in Asia. The goal was to determine the incidence and distribution of candidemia at the surveillance sites, as a first step in collecting data that can help guide prevention and treatment strategies against Candida infection in these regions. This surveillance study was designed by the AFWG and conducted with the cooperation of the microbiology or mycology laboratories of 25 hospitals – 10 in China, 1 in Hong Kong, 4 in India, 1 in Singapore, 6 in Taiwan and 3 in Thailand. Data were collected on fungi isolated from clinical specimens from July 1, 2010 through June 30, 2011. Candida isolates were considered duplicate if the same Candida species came from the same type of specimen collected within 7 days. Candida isolates from blood cultures collected >7 days apart were considered distinct episodes. The incidence of candidemia, incidence density and the species distribution of non-duplicate blood Candida isolates were determined at the hospital level, country level and full study population level. Overall, there were 1,601 episodes of candidemia for which 1,910 non-duplicate Candida blood isolates were identified to species level. The calculated incidence of candidemia was 1.22 episodes/1,000 discharges or 0.15 episodes/1,000 patient-days. Incidence varied markedly among the participating hospitals and countries/regions (Table). 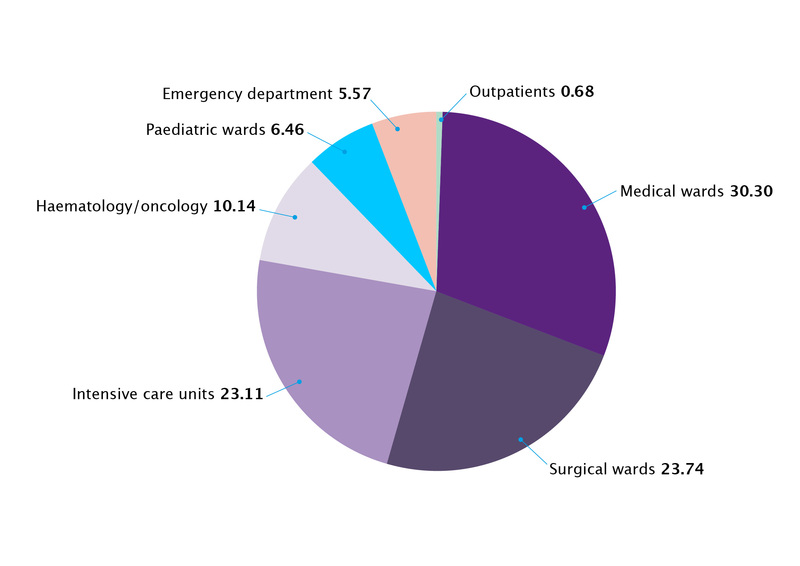 Figure 1 shows the distribution of candidemia by hospital service, with medical wards, surgical wards and ICUs accounting for about three quarters of the candidemia cases. Linear regression analysis showed that the ICU:total bed ratio was significantly correlated with candidemia incidence (R2=0.4734; p<0.001), but the hemato-oncology:total bed ratio was not (R2=0.0442; p=0.40). 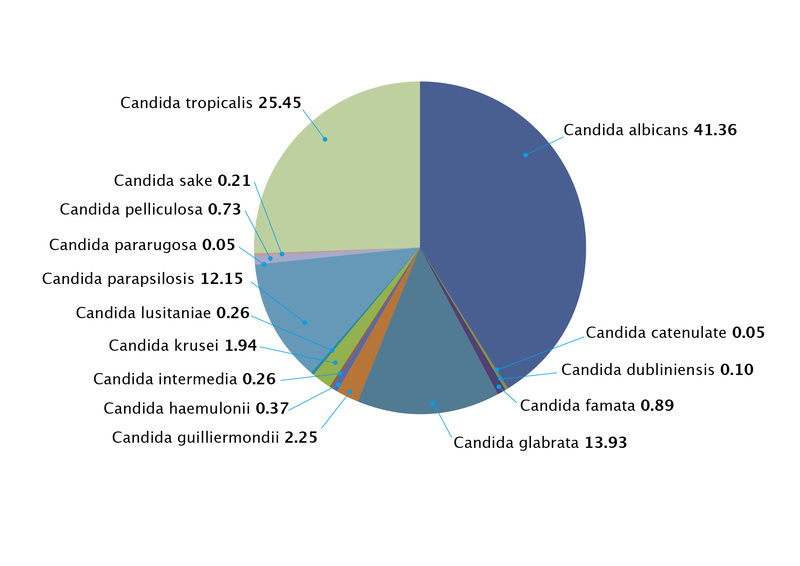 Figure 2 shows the species distribution of the 1,910 Candida blood isolates identified to species level. C. albicans was the most frequently isolated species (41%), followed by C. tropicalis (25%), C. glabrata (14%) and C. parapsilosis (12%). Figure 3 shows how the spectrum and incidence of Candida species varied among hospitals, with the relative contributions of the four common species differing among the countries/regions. Although C. albicans was the most common species overall, it accounted for <40% of candidemia in 12 of 25 hospitals (median 41.9%, range 5.56%-58.3%). The size of the circles indicates the relative number of candidemia episodes in each site. Only Candida species of 20 or more episodes at each study site are shown. The inset represents Taiwan. C. tropicalis was the leading non-albicans species overall, identified in 9.1%-83.3% (median 23.0%) of blood isolates. The proportion of C. tropicalis was higher in tropical areas (India, Thailand and Singapore) than in other geographical regions (46.2% vs 18.9%; p=0.04) (Figure 4). Tropical regions are defined as lying between the Tropic of Cancer (northern boundary) and the Tropic of Capricorn (southern boundary). For 3 of the 25 hospitals (2 in China; 1 in Taiwan), C. glabrata was the most common non-albicans species. Up to 26% of candidemia cases were caused by C. glabrata in two hospitals (1 in China; 1 in Singapore). In another 3 hospitals, C. parapsilosis was the most common non-albicans species, accounting for 33% of candidemia cases in one Indian hospital, 26% in a Chinese hospital and 14% in a Taiwanese hospital. C. krusei was rare (37/1,910), but was found in 12.2% of Candida blood isolates in one Indian hospital. C. guilliermondii was identified in 43/1,910 non-duplicate Candida blood isolates, but 22 of these 43 isolates came from different wards at a single Indian hospital. This study is the first to attempt to collect data for a multi-country overview and comparison of candidemia in Asian countries. These data reveal substantial variability in the incidence of candidemia and species distribution of Candida isolates among the hospitals, although the reasons for the differences are difficult to identify from these surveillance data. A higher proportion of ICU to total hospital beds was linked to higher candidemia rates, providing one potential source of the variability in incidence across the study sites. Only 23% of candidemia episodes occurred in ICUs in this study, perhaps illustrating that candidemia represents a risk to the general hospital population, as well as the critically ill.
Other factors that could contribute to the variations in candidemia incidence observed in this study include different antifungal prophylaxis policies in different wards, hospitals or countries, variations in blood culture sampling methods and frequency, and numbers of advanced care interventions being performed, such as chemotherapy and transplantations. The authors compared the Asian incidence data with results of a Latin American survey, observing that the incidence density data from Latin America were largely similar to the current Asian survey results and that variability across regions/countries and sites was characteristic of both areas. Like in Europe and North America, C. albicans is typically the most common cause of candidemia in the Asian sites surveyed in this study. However, C. tropicalis tended to be the most frequently identified non-albicans species in this study, in contrast to the USA and the UK where C. glabrata leads the non-albicans species. Given the geographical location, with the current study including a high proportion of sites from tropical regions, this difference is not unexpected. However, C. glabrata was responsible for about a quarter of candidemia cases in a hospital in Singapore and one in China, again underlining the inter-site variability. Documenting the role of C. tropicalis in candidemia in Asia is important because C. tropicalis infections pose some unique challenges compared with other Candida species. These include: a shorter time to positivity of blood cultures; potentially higher morbidity and mortality rates than C. albicans infections; the association of septic shock and skin emboli with C. tropicalis candidemia; and, potentially, a reduced susceptibility to fluconazole. This suggests it may be prudent to monitor fluconazole susceptibility in regions where C. tropicalis predominates and where fluconazole is often used first-line without susceptibility testing. Another noteworthy finding is the clustering of candidemia cases due to rarer species, such as C. guilliermondii and C. krusei, in some hospitals or wards. Such site-specific epidemiology reinforces the importance of performing species identification to correctly identify, and avoid underestimating, potential fungal outbreaks. Asia is a large and heterogeneous region and, although this study included 25 hospitals located at various geographic regions in Asia, it cannot claim to provide a sample representative of the region. Other study limitations include: all but one of the participating hospitals were referral centers; not all Candida isolates were successfully identified to species level; and isolate identification was performed at local laboratories, not a central reference laboratory. 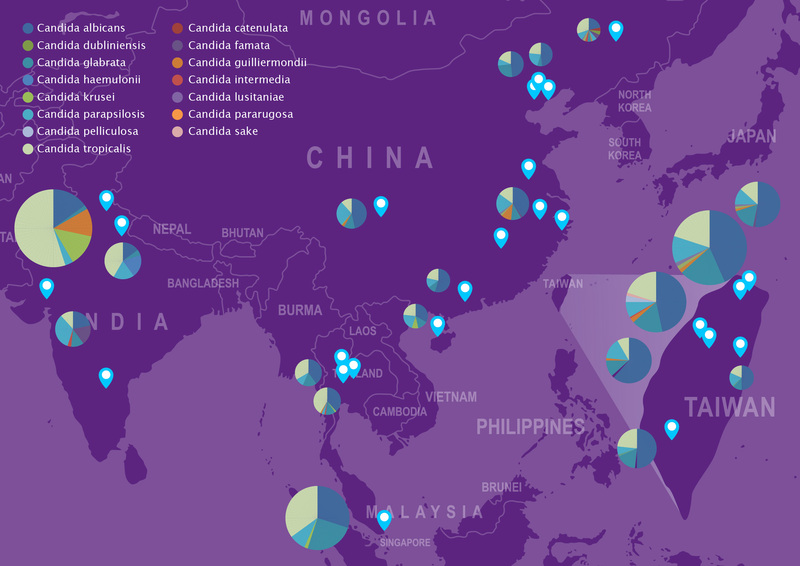 Despite the acknowledged limitations, the findings of this surveillance study do provide an overview of the incidence of candidemia and distribution of causative species in Asia. Clearly, there is considerable variability in both the incidence and species distribution of Candida isolates across the study sites; the authors conclude that these results support the importance of aggressive diagnosis, including the detection of Candida blood isolates and identification to species level, to providing adequate patient care as well as implementing appropriate infection control.